INNOVATIVE, ELEGANT AND POSITIVE DESIGN, our colors and subtle lines suggest Harmony and Enthusiasm, face your activities with joy and determination. A UNIQUE SPACE FOR EVERYTHING, the only planner that allows you to control the entire month, your weekly goals and have additional space for your notes in only one space. EXTRA ROW FOR LONGER MONTHS, Check numbers! When a month starts on a Saturday, you would be missing 2 days of the month if you were the sad owner of a generic five rows board of our competition. A GOOD PRODUCT MUST COME IN A GREAT BOX, specially designed for our most demanding customers, perfect as a gift for your family and friends. On the other hand testimonies of customers of our competition indicate that boards packed in tubes lose their flat shape and their laminate is affected. WE VALUE THE HIGH QUALITY, therefore, we offer you 12 months warranty for manufacturing defects. In this case, contact us and we will gladly assist you. Now I am able to keep track of my datys. Perfect fit for my fridge! 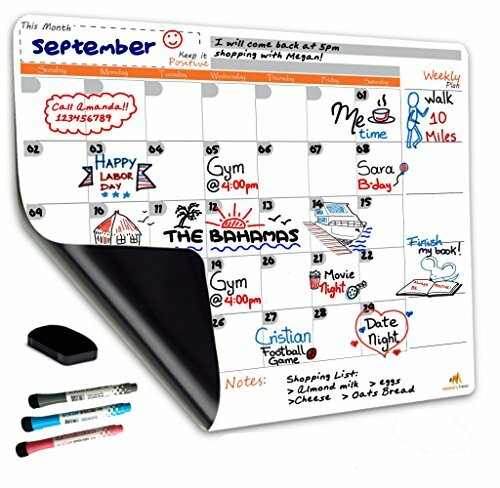 Great for keeping things organized on my 'to-do' list!